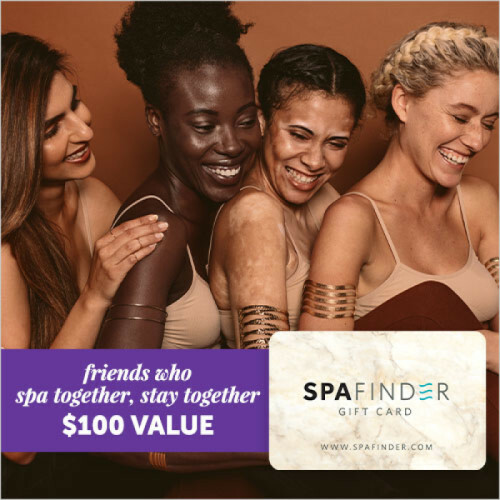 WIN 1 SPAFINDER $100 GIFT CARD! Prize Description: Celebrate local and enter for a chance to win. Enjoy massages, mani-pedis, zumba, barre classes, yoga, and more near you. Enjoy a visit to your favorite salon or spa in your city with Spafinder. You've entered for the chance to win! Follow @spafinder to stay in the loop. THESE OFFICIAL RULES APPLY TO TWELVE (12) INDIVIDUAL SWEEPSTAKES (EACH A “SWEEPSTAKES”), EACH OF WHICH HAS THE SAME TERMS (BUT FOR THE DATES) AND IS OPEN ONLY TO INDIVIDUALS WHO ARE legal residentS of, and currently residing WITHin, ONE OF the 50 UNITED STATES or THE DISTRICT OF COLUMBIA (“d.c.”), AND ARE 18 YEARS OF AGE OR OLDER AT THE TIME OF ENTRY (19 YEARS OF AGE OR OLDER IF A RESIDENT OF ALABAMA OR NEBRASKA). VOID ELSEWHERE AND WHERE PROHIBITED. THIS SWEEPSTAKES IS GOVERNED BY APPLICABLE U.S. LAWS. DO NOT ENTER IF YOU ARE NOT LOCATED IN ONE OF THE 50 STATES OR D.C. AT TIME OF ENTRY. This Sweepstakes is in no way sponsored, endorsed or administered by, or associated with, Facebook Inc. (“Facebook”). You understand that you are providing your personal information to Sponsor and not to Facebook. Facebook is not affiliated with the Sponsor in any way. SWEEPSTAKES PERIOD: Spafinder Monthly Sweepstakes (“Sweepstakes”) begins on Sept 1, 2018 at 12:00:00 p.m. Eastern Time (“ET”) and ends on August 31, 2019 at 11:59:59 p.m. ET (“Promotion Period”), but each of the twelve (12) individual Sweepstakes conducted during the Promotion Period has its own entry period (each a “Sweepstakes Entry Period”) as detailed in Rule 4, below. The database clock for the Website (defined below) will be the official timekeeping device for the Sweepstakes. ELIGIBILITY: The Sweepstakes is open only to legal residents of the 50 United States and D.C. who are 18 years of age or older at time of entry (19 or older if a resident of AL or NE). Employees. Officers and directors of Sponsor, Blackhawk Network, Inc., Promotion Activators Management, LLC (“Administrator”), their respective parent companies, affiliates, subsidiaries, distributors, suppliers and advertising and promotion agencies associated with the Sweepstakes, and members of the immediate families (defined as including spouse, biological, adoptive and step-parents, grandparents, siblings, children and grandchildren, and each of their respective spouses, regardless of where they reside) or households (whether related or not) of any of the above are NOT eligible to participate in the Sweepstakes. Non-eligibility or non-compliance with any of these Official Rules will result in disqualification. Sweepstakes is void outside of the 50 United States and D.C. and where prohibited by law. The Sweepstakes is subject to all applicable federal, state and local laws and regulations. HOW TO ENTER: During the Sweepstakes Period, go to www.spafinder.com/sweeps (“Website”), and follow the on-screen instructions to register and receive one (1) entry into the Sweepstakes that corresponds to the date on which your entry is received. Note: To enter, you must opt-in to receive Sponsor’s newsletter. However, your consent to receive Sponsor’s newsletter may be revoked at any time (without revoking your participation in the Sweepstakes or impairing your chances of winning) by sending an email message to social@spafinder.com with the word “unsubscribe” in the subject line, or using the link provided in the newsletter for the same purpose. You may enter with a valid e-mail address or by clicking on the “Enter with Facebook” option. Limit one (1) entry per person/email address per Sweepstakes Entry Period. All entries received from any person or email address that exceed the stated limitation will be disqualified. By entering via Facebook, you agree that Sponsor may have access to that which is not otherwise made private by your personal Facebook settings. Entries by any means which subvert the entry process will be void. Incomplete or illegible entries will not be acknowledged and will not be included in a Sweepstakes drawing. All entries become the exclusive property of Sponsor and will not be returned or acknowledged except as provided herein. In the event of a dispute as to who submitted an entry, the name of the “authorized account holder” associated with the email address or Facebook account will be deemed to be the entrant and must comply with these Official Rules. The authorized account holder of the email address is defined as the natural person who is assigned to the email address by an Internet access provider, online service provider, or other organization that is responsible for assigning email addresses or the domain associated with the submitted email address. The authorized account holder of a Facebook account will be determined by Facebook’s records. Sponsor will not verify receipt of entries. Released Parties (defined below) are not responsible for entries that are late, lost, illegible, damaged, misdirected, garbled or incomplete, altered or otherwise irregular, that contain false information, that are generated by script, macro or other automated or mechanical means, that have been submitted through illicit means or by any means which subvert the entry process or that do not conform with or satisfy any or all of the conditions set out in the Official Rules. Multiple entrants are not permitted to share the same email address or Facebook account for purposes of entry into the Sweepstakes. Use of any automated program or method to enter will result in disqualification of all associated entries and of the person/email address/Facebook account responsible for such entries. DRAWING SCHEDULE/ODDS OF WINNING: To be eligible for a Sweepstakes Drawing, an eligible entry must be received during the corresponding Sweepstakes Entry Period (see table below). Non-winning entries will not be included in subsequent Sweepstakes Drawings. Sweepstakes Drawings will be conducted by the Administrator, an independent judging agency, whose decisions shall be final in all matters relating to each Sweepstakes. For each Sweepstakes Drawing, four (4) winners will be selected at random from among all eligible entries received for that Sweepstakes Entry Period. Odds of winning a Sweepstakes prize depend on the total number of eligible entries received for each Sweepstakes Drawing. Limit one (1) prize per person/household per Sweepstakes Drawing. TOTAL PRIZES (48) / PRIZES PER DRAWING (4): A total of forty-eight (48) prizes will be available to be awarded for all Sweepstakes Drawings combined; four (4) prizes will be available to be awarded in each individual Sweepstakes Drawing. Each prize winner will receive one (1) $100 Spafinder Electronic Gift Card (“Prize”). Approximate retail value: $100 each. Total approximate retail value of Prizes for each individual Sweepstakes: $400. Gift cards are subject to the terms and conditions imposed by issuer. Winner is solely responsible for all federal, state, and local income taxes and other fees associated with Prize receipt and use, regardless of whether Prize is used in whole or in part. Prize is awarded “as is” with no warranty or guarantee, either express or implied, by Sponsor. No transfer, assignment, cash redemption, or substitution of Prize is permitted, except by Sponsor, who reserves the right, in its sole discretion, to substitute Prize with a prize of equal or greater value in the event the Prize becomes unavailable. All Prize details are in Sponsor’s sole discretion. In no event, shall Sponsor’s Prize liability exceed the ARV of the Prize for any reason. All prizes will be awarded provided they are claimed properly in accordance with these Official Rules. WINNER NOTIFICATIONS/PRIZE AWARD/PUBLICITY CONSENT: You are not a winner until your eligibility has been verified and it is determined that you have complied with all terms of these Official Rules. Winners will be issued their Prize via the email address they provided at the time of entry within approximately 2-4 weeks of applicable Sweepstakes Drawing and verification of eligibility and compliance with these Official Rules. If a Prize or email is returned as undeliverable, Sponsor is unable to contact a potential winner, or a potential winner is not in compliance with these Official Rules, as determined by Sponsor, the applicable Prize will be forfeited, and, at Sponsor’s discretion, an alternate winner will be randomly selected from all remaining eligible entries in the Drawing related to that Prize. Sponsor will make up to three (3) attempts to award any given Prize, and if after three (3) attempts the Prize remains unclaimed, the Prize may not be awarded in Sponsor’s discretion. Sponsor is not responsible for changes of email address or other communication problems. In no event will more than four (4) prizes be awarded per Sweepstakes Drawing, If, due to a production, technical, human or other error, more than four (4) prize notifications are issued for any Sweepstakes Drawing, the four (4) intended prizes will be awarded in a random drawing from among all valid recipients of such prize notifications. Acceptance of Prize will further constitute and signify winner’s agreement and consent that Sponsor and/or Sponsor’s assignees may use a winner’s name, likeness, city and state of residence, and/or Prize information for promotional purposes in any media worldwide without limitation and without further notice or compensation, except where prohibited by law. GENERAL: By participating, entrants agree to abide and be bound by these Official Rules and the decisions of Administrator, which are final and binding in all matters. Entrants further agree to release, discharge and hold harmless Sponsor, Blackhawk Network, Inc., Administrator, Facebook, their respective parent companies, affiliates, subsidiaries, distributors, suppliers and advertising and promotion agencies associated with the Sweepstakes, and all other service agencies involved with design, execution or fulfillment of this Sweepstakes, and the respective directors, officers, agents and employees of the foregoing (collectively, the “Released Parties”) from and against any liability, claims, losses and damages of any kind, including death, to persons or property, arising out of, or relating to, their participation in this Sweepstakes, and the acceptance, use, misuse or possession of a Prize, including as set out in the Limitations of Liability section. Entrants who Sponsor or Administrator determine to have not complied with these Official Rules are subject to disqualification. Sponsor reserves the right, at its sole discretion, to disqualify any entrant from this Sweepstakes or any other promotion conducted now or in the future by Sponsor or any of its affiliates if Sponsor suspects or finds entrant to be: (a) violating the Official Rules; (b) tampering or attempting to tamper with the entry process or the operation of the Sweepstakes or the Website; (c) acting in an unsportsmanlike or disruptive manner, or with the intent to annoy, abuse, threaten or harass any other person or (d) attempting to undermine the legitimate operation of the Sweepstakes by cheating, hacking, deception, or other unfair playing practices or intending to annoy, abuse, threaten or harass any other entrants, Administrator, Sponsor or Sponsor’s representatives. If Sponsor or Administrator suspects that an entrant has engaged in an unsportsmanlike or disruptive manner, the entrant will be contacted as soon as practicable. ANY ATTEMPT BY AN INDIVIDUAL TO DELIBERATELY DAMAGE THE WEBSITE OR UNDERMINE THE LEGITIMATE OPERATION OF THIS SWEEPSTAKES MAY BE A VIOLATION OF CRIMINAL AND CIVIL LAWS, AND SHOULD SUCH AN ATTEMPT BE MADE, SPONSOR WILL DISQUALIFY ANY SUCH INDIVIDUAL AND RESERVES THE RIGHT TO SEEK DAMAGES AND OTHER REMEDIES (INCLUDING ATTORNEYS’ FEES) FROM ANY SUCH INDIVIDUAL TO THE FULLEST EXTENT PERMITTED BY LAW, AND TO BAN OR DISQUALIFY AN ENTRANT FROM THIS AND FUTURE SWEEPSTAKES. All materials submitted become the property of Sponsor and will not be returned. LIMITATION OF LIABILITY: Released Parties do not assume any responsibility for, and the entrant hereby releases the Released Parties from, any and all claims, actions, damages, demands and liabilities of whatever nature or kind arising out of, or in connection with, the entrant’s participation or attempted participation in the Sweepstakes, including, without limitation, the administration of the Sweepstakes, the selection and confirmation of winners, and the arranging, awarding and use of the Prizes. Without limiting the generality of the foregoing, the Released Parties are not responsible for (i) the incorrect or inaccurate capture of entry information for any reason; (ii) late, lost, stolen, damaged, misdirected, garbled or incomplete entries, transmissions or transactions, entries that are altered or otherwise irregular, have been submitted through illicit means or do not conform with or satisfy any or all of the conditions of the Official Rules; (iii) any loss, damage, or claims caused by, or in any way related to, the awarded Prizes or the Sweepstakes itself; (iv) failure of the Website or any operations or transmission of information during the Promotion Period, including, without limitation, any problems, human, production or technical errors, lost, delayed, garbled or corrupted data or transmissions, omissions, interruptions, deletions, defects or failures of any telephone or transmission lines, technical malfunctions of any computer on-line systems, servers, access providers, computer equipment, software, failure of any e-mail or entry to be received on account of technical problems or traffic congestion on the Internet or at any website, or any combination thereof including, without limitation, any injury or damage to an entrant’s or any other person's computer related to or resulting from participating in or downloading any material connected to the Sweepstakes, all of which may affect a person’s ability to participate in the Sweepstakes; (v) any typographical or other error or omission in any printing or advertising relating to the Sweepstakes, in the administration or execution of the Sweepstakes, or in the announcement or notification of prize winners; (vi) the security or privacy of information transmitted via computer networks or for breaches of privacy due to interference by third party computer "hackers" or otherwise; (vii) any claims regarding the accepting, arranging, awarding or use of a Prize; (viii) electronic communications which are undeliverable as a result of any form of active or passive filtering of any kind; or (ix) cheating or fraud by any participant. Entry material/data that has been tampered with or altered is void. Sponsor reserves the right, at its sole discretion, to amend the Official Rules for clarification purposes, at any time, in any way, and without prior notice, without materially affecting the terms and conditions of the Sweepstakes. Without limiting the foregoing, if for any reason the Sweepstakes is not capable of running as originally planned, including should any virus, worm, bug, technical failures, unauthorized human intervention, social media mandate or other causes corrupt or affect the administration, security, fairness or proper conduct of the Sweepstakes, Sponsor reserves the right to modify, terminate or suspend this Sweepstakes (or portion thereof). In the event of termination, Sponsor may conduct the random Sweepstakes Drawing for the Sweepstakes Entry Period then in-progress from among all eligible, non-suspect Sweepstakes entries received up to date/time of such termination, or up to the date/time of the situation warranting such termination. BINDING ARBITRATION: Any controversy or claim arising out of or relating to the Sweepstakes shall be settled by binding arbitration in a location determined by the arbitrator as set forth herein (provided that such location is reasonably convenient for claimant), or at such other location as may be mutually agreed upon by the parties, in accordance with the procedural rules for commercial disputes set forth in the Comprehensive Arbitration Rules and Procedures of JAMS (“JAMS Rules and Procedures”) then prevailing, and judgment upon the award rendered by the arbitrator(s) may be entered in any court having jurisdiction thereof. The arbitrator shall be selected pursuant to the JAMS Rules and Procedures. The arbitrator shall apply California law consistent with the Federal Arbitration Act and applicable statutes of limitations and shall honor claims of privilege recognized at law. In the event that the claimant is able to demonstrate that the costs of arbitration will be prohibitive as compared to the costs of litigation, Sponsor will pay as much of the claimant’s filing and hearing fees in connection with the arbitration as the arbitrator deems necessary to prevent the arbitration from being cost-prohibitive. If any part of this arbitration provision is deemed to be invalid, unenforceable or illegal (other than that claims will not be arbitrated on a class or representative basis), or otherwise conflicts with the rules and procedures established by JAMS, then the balance of this arbitration provision shall remain in effect and shall be construed in accordance with its terms as if the invalid, unenforceable, illegal or conflicting provision were not contained herein. If, however, the portion that is deemed invalid, unenforceable or illegal is that claims will not be arbitrated on a class or representative basis, then the entirety of this arbitration provision shall be null and void, and neither claimant nor Sponsor shall be entitled to arbitrate their dispute. Upon filing a demand for arbitration, all parties to such arbitration shall have the right of discovery, which discovery shall be completed within sixty (60) days after the demand for arbitration is made, unless further extended by mutual agreement of the parties. THE ARBITRATION OF DISPUTES PURSUANT TO THIS PARAGRAPH SHALL BE IN THE ENTRANT’S INDIVIDUAL CAPACITY AND NOT AS A PLAINTIFF OR CLASS MEMBER IN ANY PURPORTED CLASS OR REPRESENTATIVE PROCEEDING. THE ARBITRATOR MAY NOT CONSOLIDATE OR JOIN THE CLAIMS OF OTHER PERSONS OR PARTIES WHO MAY BE SIMILARLY SITUATED. DO NOT ENTER THIS SWEEPSTAKES IF YOU DO NOT AGREE TO HAVE ANY CLAIM OR CONTROVERSY ARBITRATED IN ACCORDANCE WITH THESE OFFICIAL RULES. BY PARTICIPATING IN THE SWEEPSTAKES, EACH ENTRANT AGREES THAT TO THE EXTENT PERMITTED BY APPLICABLE LAW: (1) ANY AND ALL DISPUTES, CLAIMS AND CAUSES OF ACTION ARISING OUT OF OR CONNECTED WITH THE SWEEPSTAKES, OR ANY PRIZE AWARDED, WILL BE RESOLVED INDIVIDUALLY THROUGH BINDING ARBITRATION AS SET FORTH ABOVE, WITHOUT RESORT TO ANY FORM OF CLASS ACTION; (2) ANY AND ALL CLAIMS, JUDGMENTS AND AWARDS WILL BE LIMITED TO ACTUAL THIRD-PARTY, OUT-OF-POCKET COSTS INCURRED (IF ANY), BUT IN NO EVENT WILL ATTORNEYS' FEES BE AWARDED OR RECOVERABLE; (3) UNDER NO CIRCUMSTANCES WILL ANY ENTRANT BE PERMITTED TO OBTAIN ANY AWARD FOR, AND ENTRANT HEREBY KNOWINGLY AND EXPRESSLY WAIVES ALL RIGHTS TO SEEK, PUNITIVE, INCIDENTAL, CONSEQUENTIAL OR SPECIAL DAMAGES, LOST PROFITS AND/OR ANY OTHER DAMAGES, OTHER THAN ACTUAL OUT OF POCKET EXPENSES, AND/OR ANY RIGHTS TO HAVE DAMAGES MULTIPLIED OR OTHERWISE INCREASED; AND (4) ENTRANT'S REMEDIES ARE LIMITED TO A CLAIM FOR MONETARY DAMAGES (IF ANY) AND ENTRANT IRREVOCABLY WAIVES ANY RIGHT TO SEEK INJUNCTIVE OR EQUITABLE RELIEF. SOME JURISDICTIONS DO NOT ALLOW THE LIMITATION OR EXCLUSION OF LIABILITY FOR INCIDENTAL OR CONSEQUENTIAL DAMAGES, SO RELEVANT PORTIONS OF THE ABOVE MAY NOT APPLY TO EVERY ENTRANT. By entering, entrants agree that all issues and questions concerning the construction, validity, interpretation and enforceability of these Official Rules, participant’s rights and obligations, and the rights and obligations of the Sponsor in connection with the Sweepstakes, will be governed by, and construed in accordance with, the laws of State of California, without giving effect to any choice of law or conflict of law rules (whether of California or any other jurisdiction), that would cause the application of the laws of any jurisdiction other than California, and any matters or proceedings which are not subject to arbitration as set forth above in this Rule 9 of these Official Rules, and/or for entering any judgment on an arbitration award, shall take place in the State of California in Alameda County. WINNERS’ NAMES: For the winners’ names (available after winners have been verified), send a self-addressed, stamped, business size (#10) envelope by October 31, 2019 to: Spafinder Winners, 5550 Touhy Ave, Suite 403, Skokie, IL 60077. RULES GOVERN. In the event of any discrepancy or inconsistency between the Official Rules and disclosures or other statements contained in any Sweepstakes related materials or made by any representative of Sponsor, these Official Rules shall prevail, govern and control. SPONSOR: Blackhawk Issued Content, LLC, 6220 Stoneridge Mall Rd., Pleasanton, CA 94588. ADMINISTRATOR : Promotion Activators Management, LLC, 5550 Touhy Ave, Suit 403, Skokie, IL 60077. Any questions, comments or complaints regarding this Sweepstakes should be directed to Sponsor or Administrator, and not to Facebook.